In this era of specialization and superspecialization, family medicine has become a neglected entity. Leave aside being considered as a post graduate subject, it is not even adequately covered in the undergraduate curriculum in India. The doctor fraternity seems to overlook that even after becoming a specialist in a particular field of medicine, they will still remain family doctor for their near and dear ones. The developed countries have realized the need for family physicians as evidenced by a growing demand for a doctor who can be a link between the patient and centers of advanced health care. In less developed regions also, there is a growing awareness of the need to train young medical graduates in family practice. The Medical Council of Hong Kong emphasized the need for family medicine exposure during internship training. 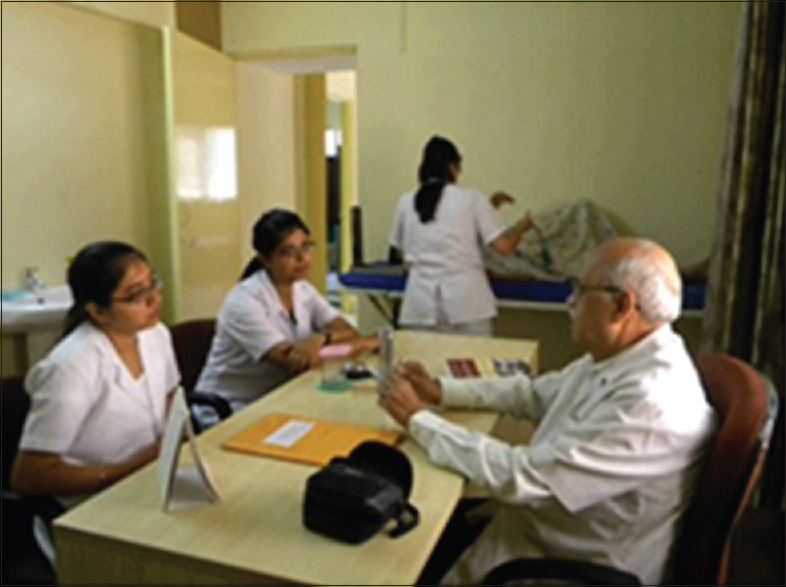 The Medical Council of India has not laid down any guidelines for specific training or exposure in family medicine at the undergraduate level or during internship. With the Department of Community and Family Medicine coming up in the newly established All India Institute of Medical Sciences in different states, it is implied that the exposure to family medicine to the undergraduates and interns should occur during their postings to the Department of Community Medicine in the Medical Colleges. Against this background, a small attempt was made by devising a 15 days program for the interns during their posting in Urban Health Training Center (UHTC), under the Department of Community Medicine of a Medical College. At the end of the training, a feedback form was obtained from the interns. To ensure objectivity, the feedback form was given to them after completion of their posting in the center. Signing the form or writing the name was optional. The training program started in 2006. The number of interns posted at a time varied from 4 to 20 depending on the number of students in the batch which have passed out together. The training had following three components: clinical training, classroom teaching, and practical training. During clinical training, interns were asked, two at a time, to sit with the author and examine the patients [Figure 1]. They were shown how to keep the clinical examination focused and short but complete. They were also guided and corrected in eliciting various clinical signs. They were encouraged to analyze the clinical finding in considering the diagnosis and differential diagnosis. Future scenario in health care. 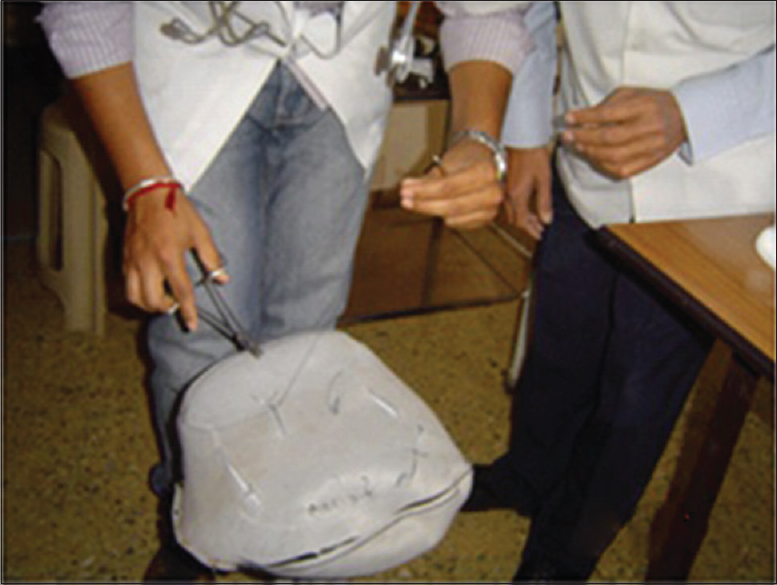 The author had devised some innovative methods such as the one shown in [Figure 2] so that a procedure can be practiced by the intern. The interns were exposed to this program at three different times. The first group was posted at the start of the internship and hence did not have very little exposure to handle patients. Those who were posted after 5–6 months had completed their posting in some of the clinical departments, while some of them attended this training after finishing all the clinical postings. A comparison of response of these three groups was sought so as to find whether this training remains relevant even after the intern's exposure to various clinical departments. The majority of the interns gave high scores on the relevance and usefulness of orientation to family medicine during their stint at the UHTC. A few sample comments are reproduced below. When this training program was started, the author did not have any template to design the curriculum. He depended primarily on his own experience of working in general OPD for 30 years. He was greatly helped by discussion with his GP friends practicing family medicine for similar duration. Being from the surgical background, the author felt it necessary to give more importance to the opinion of his physician colleagues, so that the course becomes evenly balanced between medical and surgical disciplines. Another fact which emerged from the study was that the perception of the participants on the usefulness of the program remained unaltered whether they had attended it before, in between, or after the completion of their posting in major clinical postings. While interacting with the interns, it was noticed that they are unsure about their future career once they complete the internship. Hence, on their request, although it is not a part of family medicine, a couple of sessions were added about career planning. The author briefed them about the types of temperament conducive to medical, surgical, Ob/Gyn, and pediatric specialties which they should consciously develop so that they can be mentally comfortable in a particular field of specialization. They were given an overview of life in various specialties. Future scenario of the health-care sector was also painted for them. In the end, it was emphasized that they should select the career after careful thinking and after discussing it with some person who is in the concerned specialty for 15–20 years as the author can only provide a general overview. It was a great privilege to interact with young medical graduates, uninterruptedly for 10 years. The author admits candidly that the benefit was reciprocal and equal. It kept the author updated and methodical in dealing with patients. The first exposure with the new batch of interns used to be the sensitization lecture which the author used to take as part of the orientation program of interns at the start of their internship. Fresh from a grueling examination and hence a little boisterous, it needed some efforts to keep them attentive and interested in the hour-long session. On the very next day, a batch of interns used to start their posting at the UHTC, and their skepticism about the benefits of spending time at a small peripheral health unit was obvious on their faces. However, it was heartening to see them getting progressively involved in examining patients, eliciting positive findings, and discussing treatment. They were quite forthcoming in answering question and asking their queries. Many a times, it was observed that since they already knew the theoretical details, a little prompting helped them come out with the right answer. The interns were very enthusiastic to perform simple procedures such as IM injections and dressings on the patients. They were attentive to learn the practical tips about various minor procedures. As far as classroom sessions are concerned, it was found that it helps, if the talk is kept interactive and full of case examples. The session most liked by them was on career counseling. The interns were a little shy in revealing their future career plans. Their liking for a particular subject for postgraduation was also found to be based on superficial knowledge about working conditions in a particular specialty. The interns were found to be conscious of the uncertainty about cracking the postgraduate entrance examination and getting the subject of their choice. It was satisfying to see that, at the end of the session on career counseling, they agreed to give a more detailed thought to this issue. They also understood that in current state of competition, they will not get an opportunity to change the career in the midstream. The author discussed many a times, what can motivate a young doctor to work in rural area. The answer always was that if city like conditions in accommodation, transport, and entertainment are provided, they can work in semiurban places. They were well aware of the fact that they will get huge opportunity to learn and refine their skills in a peripheral medical establishment. From the sustained interaction with young medical graduates, for a decade, the author is apprehensive of some of the pitfalls in today's situation. It may so happen that an intern may join a postgraduate course in a subject about which s/he has little aptitude. In the opinion of the author, it will be an unnerving experience for a youngster to work in a job, of not the first choice, for the next 30–40 years. Therefore it is suggested that postgraduate entrance tests should be held at the start of internship program and some credit points should be given for aptitude in the chosen subject during the internship. He also feels that if the internship is shifted to a district hospital, it will be beneficial to the interns as well as to the medical staff working in such hospitals. To conclude, the author enjoyed the experience of seeing a visibly skeptical youngster, leaving the program bright eyed on learning few things and agreeing to remain in touch with the alma-mater. Champlin L. Higher demand for family physicians bodes growth despite sluggish pay increases: From the American Academy of Family Physicians. Ann Fam Med 2005;3:89-90. Kung K, Lam A, Wong KW, Chan CW, Wong C, Wong SY, et al. Family medicine internship training: Importance for Hong Kong's primary care. Hong Kong Med J 2012;18:167-9.